Lessons from a pilot’s experiences surviving a catastrophe. The date was January 15, 2009. Captain Chesley ‘Sully’ Sullenberger suddenly realized he was in an alarmingly complex situation. In fact, no other commercial airline pilot had previously experienced it. He was piloting a completely disabled Airbus 320 a mere 3,200 feet above New York City – one of the most densely populated places on the planet. In that same instant, Sullenberger had a flash of insight that helped save the lives of all 155 passengers onboard US Airways 1549. The skyscrapers of New York City agonizingly close, Sullenberger’s moment of clarity was the realization that he was no longer flying a powered commercial aircraft. Instead, he recognized he was piloting a 70-ton glider. Drawing upon his US Air Force experience flying gliders, Sullenberger immediately lowered the nose of the plane to change its pitch and maintain optimal glide speed. The maneuver allowed him to create maximum forward momentum as the aircraft’s wings sliced through the air, creating lift and buying him the precious seconds he needed to clear the George Washington bridge by less than 900 feet, before successfully ditching the aircraft into the Hudson River. Insights like Sully’s represent moments of clarity that emerge serendipitously from a seemingly endless cacophony of complexity. Insights are non-obvious and unexpected, qualitative and profound, and relevant and constructive. They lead to a discovery that momentarily clarifies the complex by revealing something that previously went unnoticed, or by recognizing something familiar from a different perspective. This revelation or recognition – in turn – leads to an unexpected decision or course of action that can yield an unexpected positive outcome. Sullenberger’s ‘glider’ insight momentarily clarified the complexity of his operating context, allowing him to identify a positive progression-path of decisions and actions that avoided almost certain disaster. The pilot’s ability to reframe what he saw, rewire what he thought, and reconfigure what he did in response to his moment of clarity culminated in what became written into US national history as the Miracle on the Hudson. Many leaders in organizations today find themselves dealing with complex situations that are strikingly similar to the one Sully faced on that fateful day in 2009: the environment within which they are operating is uncertain; the outcomes they are striving to achieve are unpredictable; and the consequences of the rapid-fire decisions they make, and actions they take, can lead to the sudden demise of their enterprise. Like Sully, leaders captaining their enterprises must learn to successfully navigate complexity by reframing what they see, rewiring what they think and reconfiguring what they do to ensure that their organizations operate in a perpetual state of readiness for the unexpected. But where do we begin? 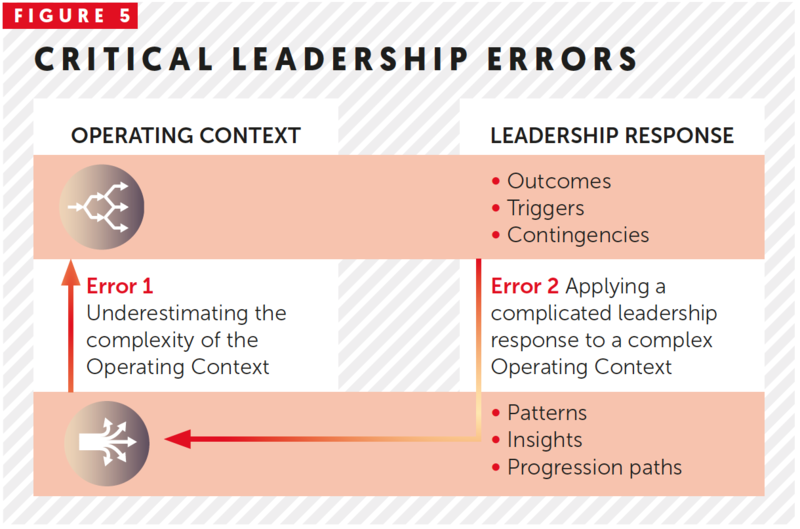 As the connectedness and complexity of an organization’s operating context increases exponentially, leadership’s ability to anticipate environmental shifts and predict outcomes plummets precipitously. In navigating an increasingly volatile, uncertain, complex and ambiguous (VUCA) business environment, organizations find themselves vacillating violently between complicated and complex operating contexts, with many plunging perilously to their demise in the gaping chasm that exists between them: more than half of the Fortune 500 have disappeared since the year 2000. In complicated operating contexts, the connection between cause and effect is knowable. Decision trees of possible outcomes can be identified, risks and probabilities around these outcomes can be calculated, and contingency plans for each path can be pre-determined, controlled and de-risked. In complex operating contexts, by contrast, the relationship between cause and effect cannot be predetermined. Patterns of relationships and interactions emerge and recede in unpredictable ways, momentarily revealing possible progression-paths to pursue that vanish as quickly as they appear. Both the outcomes themselves, and the paths to get there, are emergent and cannot be predicted, controlled and de-risked ahead of time. 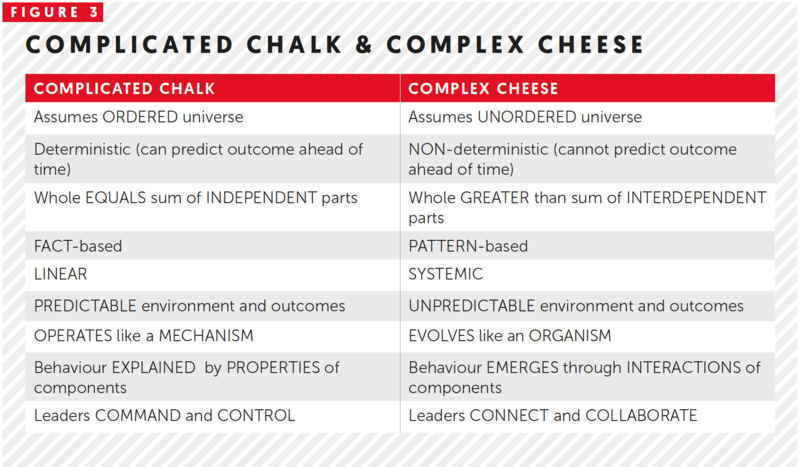 The two operating contexts could not be more different from one another: complicatedness is like chalk, while complexity is like cheese. Each operating context requires its own unique leadership response. 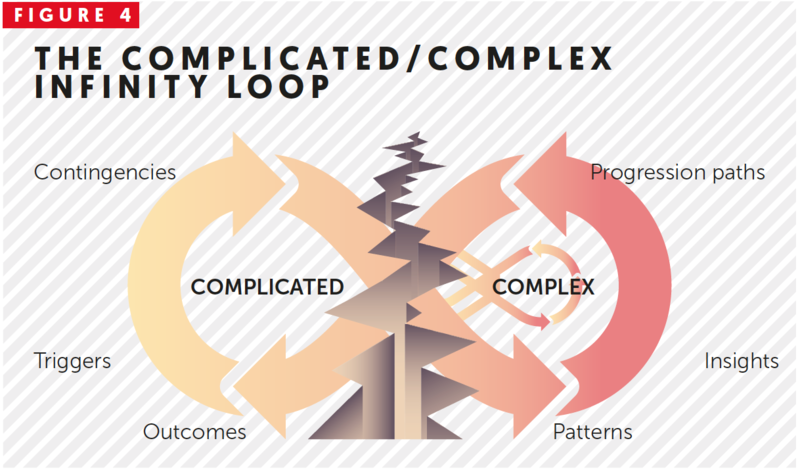 As leaders navigate back and forth between complicated and complex operating contexts, they must repeatedly identify which side of the complexity chasm they are operating in. Then they must immediately apply the leadership response required within that context. The leadership response required in a complicated operating context involves in-depth analysis of known possible outcomes to determine an optimal course of action, identifying risks to this optimal path and isolating trigger points that would invoke contingency plans to minimize these risks. To avoid being derailed in this operating context, leaders must counteract their desire to over-analyse, avoid placing too much stock in the advice of subject-matter experts, and overcome the blindness of their own biases. In so doing, they can effectively and efficiently deliver against a given expected outcome. Leaders learn – often the hard way – that there is a complexity threshold above which attempting to maintain control inevitably leads to failure. Leaders seeking to successfully navigate complex operating contexts must first and foremost unlearn the lessons of experience they adopted in successfully navigating complicated ones. Attempting to navigate a complex operating context by applying a complicated leadership response often exacerbates the situation, culminating in devastating unanticipated outcomes. Complex operating contexts are unordered, unpredictable and uncontrollable. They consist of polarities to be navigated, not problems to be solved. And they require a much more agile and adaptive leadership response. 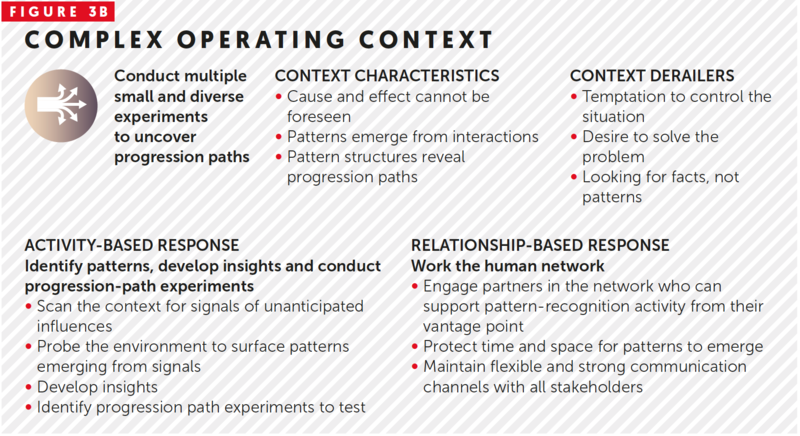 The leadership response required in a complex operating context involves ongoing iterations of test-and-learn experimental cycles to identify patterns, develop insights and discover high-leverage progression-paths. To avoid being derailed in this operating context, leaders must overcome their temptation to control the situation, delay their desire to problem-solve, stop seeking facts and start uncovering patterns. Once a potential progression-path is identified within the complex operating context, leaders move back across the chasm into the complicated operating context by taking swift action to test the progression-path and learn whether or not the course of action it revealed will achieve the desired outcome. There are two fatal errors that leaders commit in navigating back and forth across the complexity chasm. First, they misdiagnose their operating context, often assuming it is complicated when it is actually complex. Second, they apply an incompatible leadership response for the context they are operating in, often applying a complicated leadership response while operating in a complex operating context. Einstein is widely credited with the quip “everything should be made as simple as possible, but no simpler”. As human beings, we naturally gravitate towards the comfort of simplicity and clarity, and away from the anxiety of complexity and ambiguity. This natural tendency to seek stability, coupled with our innate desire to quickly resolve a given problem, often causes us to underestimate the novelty and complexity of the situation at hand. Our strong desire to bring a situation back into control causes us to oversimplify the operating context and apply the wrong leadership response, resulting in unanticipated and, sometimes, catastrophic consequences. 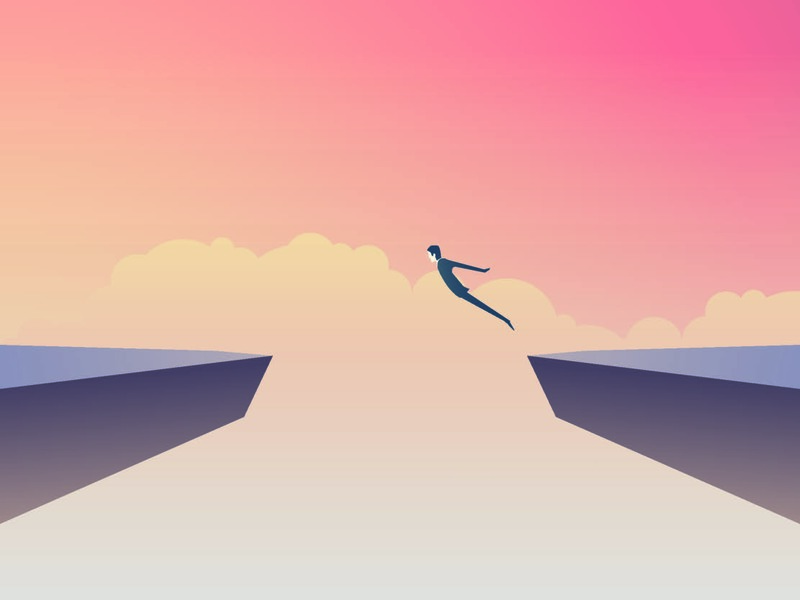 To avoid peril in traversing the complexity chasm, leaders must learn to overcome their natural proclivity to commit these errors by reframing what they see, rewiring how they think and reconfiguring what they do. First, leaders must learn to reframe what they see by relinquishing control and adopting a beginner’s mindset. Instead of launching headlong into solving an unanticipated problem or deciding upon a critical course of action via traditional command and control, leaders must learn to connect and collaborate openly around the issue at hand. Successfully navigating a complex operating context is dependent on synthesizing multiple diverse perspectives in order to develop a collective holistic appreciation for what is actually going on. In complex contexts, none of us is as smart as all of us, and breadth and depth of perspective in making sense of the complex operating context increases the likelihood of survival. Second, leaders must learn to rewire how they think by applying an iterative insight-driven cognitive approach, as opposed to a linear hypothesis-driven one. An insight-driven approach requires that leaders recognize patterns that emerge from the complex web of relationships and interactions occurring within the complex operating context, develop insights around the underlying structures that cause these patterns and identify possible progression-paths to move back towards stability and control. In complex environments, there are no mistakes. Instead, every unsuccessful progression-path is reframed as an opportunity to learn and adapt. Tolerance for making mistakes and resilience in recovering from them lies at the very core of the collective sense-making process required to successfully to navigate complexity. Third, leaders must learn to reconfigure what they do. The more connected we become, the less control we have. The reality today is that organizations are a complex and interdependent amalgamation of people, processes and technologies. 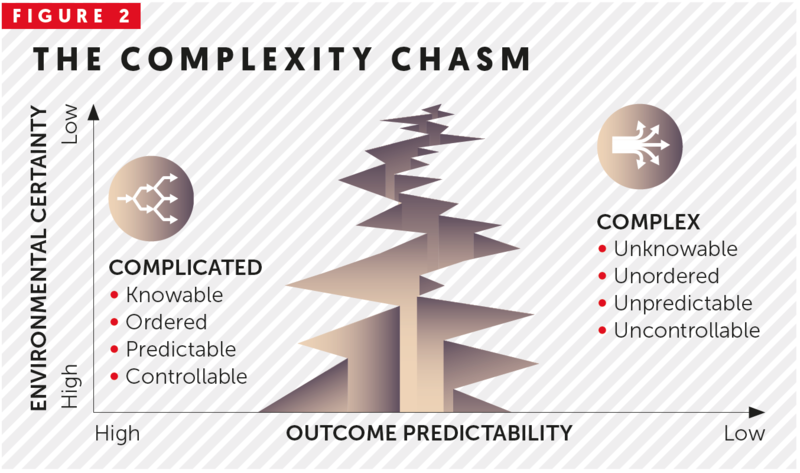 To successfully navigate back and forth across the complexity chasm, leaders must reach beyond traditional organization boundaries to bring together disparate and diverse sets of people, processes and technologies, and reconfigure them in real time to synchronize with their operating context. It is only through collaborative engagement and agency around a collective shared perspective that organizations can seize opportunities for growth that will sustain them. So, when you next find yourself facing a frighteningly complex situation, remember to reframe what you see, rewire how you think and reconfigure what you do to ensure you do not commit a fatal leadership error. Try to be a little like Sully and, as you glide to safety, always remember that navigating complexity is definitely not complicated! — Dr Tony O’Driscoll is a professor at Duke University’s Fuqua School of Business and Academic Director for The Adaptive Strategic Execution Program (ASEP) in which he teaches a course on Making Sense of Complexity.